I Am Endorphin Dude, See Me Run! On April Fool's Day I thought I was having a heart attack. No joke. I knew I had to make some changes in my life, so I took my dog for a walk around the block. That short walk turned into two blocks, then three, and before I knew it, I was walking 4-5 miles. This lead to a jog, and then a run. That run ultimately lead to a marathon. Bottom line, I got healthy and took control of my life. This blog chronicles my journey. 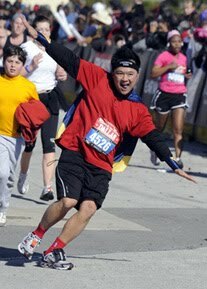 When I run, I feel like a super hero. I AM ENDORPHIN DUDE, SEE ME RUN! I really didn't have too much time to bask in the glory of my Quarry Turkey PR, as I had to jump in the car and drive 120 miles to the next half marathon! By the end of this weekend, I will have completed 55.5 miles, and Run Turkey Run Day 2 will undoubtedly be the toughest of the five races. To psyche myself out, I kept saying over and over again in my head that this is like a 12 hour race with a big break in the middle. I can certainly get a marathon distance in 12 hours with a nice 3 hour rest in the middle, right? What I didn't account for was daylight savings time and the fact that the park where the race was held would close at sun down. Very scenic by day, but when the sun went away, The Headless Horse Man lurked. Jennifer Walker and I arrived at the start line a little after 3pm. The two of us knew that we only had a four hour window to get this done so we booked it. We kept telling ourselves that all we had to do was go 6.55 miles out and back. We kept a solid power walk pace up to about mile 7 before Mother Nature dimmed the lights. As it got darker and we got slower, we both knew that we had to split up. With the park closing their gates at sun down, there was no way we would be able to make it back to the car at the rate we were going. We figured if I ran the final 10k, I could get there before the gate locked us in. It not only got darker, but it also got colder. I ran like my life depended it on. I kept a solid speedy pace, which quite frankly shocked me, as I had just run a 2:06 half marathon a few hours before. The adrenaline kept me going. Well, that and the fact that in my mind the Headless Horse Man was chasing me! 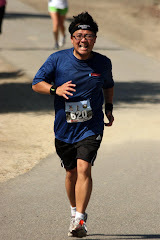 At about mile 11, I received a call from race director Tracy letting me know that my time was running out. It felt like that scene from the movie Krull when the Widow of the Web gives Ynir the sand from the enchanted hourglass, and he only had minutes to escape the Crystal Spider. (WHOA, did I just completely geek out there? Yeah, Krull was one of my favorite films as a kid.) I thanked Tracy for her warning and I continued to run. When I finally hit mile 13.1 and turned into the parking lot, I saw a vehicle with it's lights on waiting for me. At first I thought it was the park ranger, but upon closer inspection, I realized it was fellow runner Chris Wallen, who also took the late start and was waiting for me. Chris let me know that he talked the park ranger in keeping the gates open until I was done. I thanked him for saving our butts! It felt great knowing that I ran strong and got the job done. I congratulated Chris and then moved the car outside of the park to wait for Jennifer to finish her race. Thanks for saving our butts, Chris! 42.4 miles in three days completed! I only have one half marathon left and I complete my 55.5 mile Thanksgiving weekend. Jennifer and I were absolutely beat when we made it back to the Doggie Nanny's place. We took our finish line photo and then passed out. Just one more and we're done! 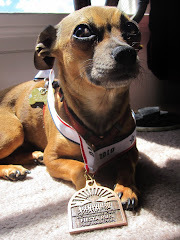 I am Endorphin Dude, and I will be running 52 marathons this year for all of the Epinephrine Pup's homeless four legged friends. All proceeds from my fundraising will go to the Peninsula Humane Society, the folks who helped me find my side kick. This dog has changed my life for the better, and it is my hope that her furry friends at the Peninsula Humane Society will do the same for another. 52 down, 0 to go. Every time I run a half marathon, I feel like I've just added 13.1 years to my life. When I ran my first full marathon, I felt immortal. Men's Health Urbanathlon - OH BOY! Every post race shot you see has me smiling ear to ear. 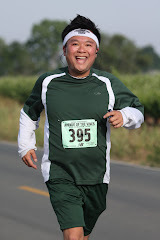 What you don't see is the grimace on my face when I cramp up at mile 11. You don't see the frustration when I wake up at the crack of dawn to train. You don't see the tears of pain as I push to climb those hills. Running is difficult, and I work damn hard. It may seem that I make these races look easy because I do so many of them and have so much fun, but I can assure you that they are not. No false modesty here. Running is hard and I surprise myself every time. My first marathon. I have to admit, I don't love this picture, but it has grown on me. I'm not used to seeing myself like this. I'm usually smiling or striking a fun pose. I wasn't going to post this photo, but it really is an accurate and authentic representation of what I was feeling at that moment. What an incredible experience. I was the fat kid who always got picked last in P.E. 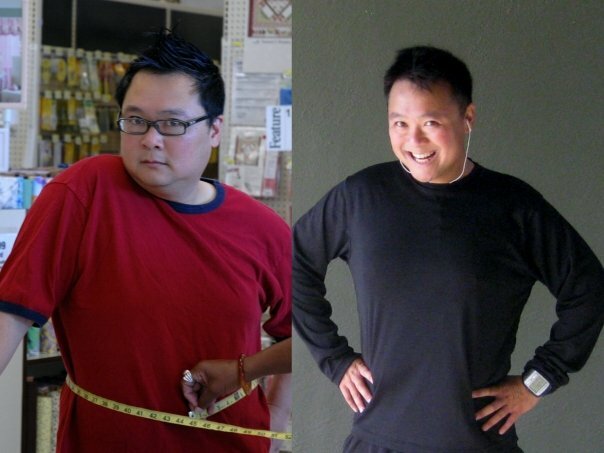 I grew up and became an obese type two diabetic adult. Exercise was something I knew nothing about. One day, I thought I was having a heart attack as a result of my sedentary and nutritionally reckless lifestyle. I knew I had to make some changes. I started walking my dog around the block. That walk lead to jog, and then a run. Next thing I know, I'm running marathons. These are the 26.2 reasons why I run. It's all about being healthy. I value life too much to see it come to a premature end due to unhealthy choices. Every time I run, whether it be a light jog around the block or a marathon, my heart thanks me. I am Endorphin Dude! There is definitely an air of invincibility when I'm out there on race day. Nothing can stop me. I am a super hero. Two words: INSANE ASYLUM. I am certifiably running crazy, and there’s a whole lot of people out there just like me. We are Marathon Maniacs and Half Fanatics, and we would run a race every weekend if we could! I hate needles. Before I started running, I had to inject insulin into my body every night. I hated being diabetic. Thanks to all these races, I have reversed that awful disease and I am no longer dependent on meds. My dog loves it because I have more energy to take her out and about. No longer is the chiweenie sequestered in the apartment. I like my bread and spaghetti. I can carb up without guilt! I love to travel. Going from city to city and state to state to run a race is pretty awesome. A few years ago, I had a hard time walking up a flight of stairs. Now I am able to endure 26.2 miles and 50ks. You never know what's going to happen on race day. 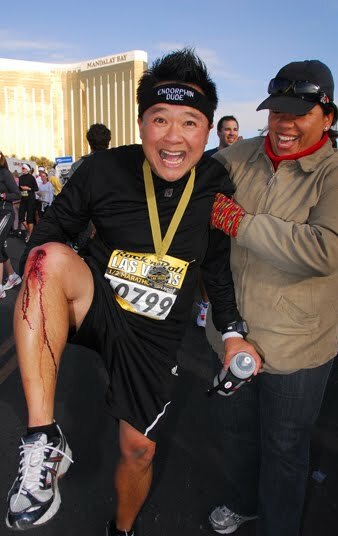 At one race I fell on both my knee caps and had to wobble to the finish line. At another, I had to take cover because of a hurricane and a tornado watch. Whatever happens, you just have to push through it. It's definitely a test of mental toughness and endurance. Running makes me strong all around. Mr. Bubble. I get to spend quality time with Mr. Bubble. I love Mr. Bubble. 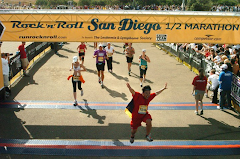 Somewhere along the way, Endorphin Dude became a marathon celebrity. Is it the cape? Is it the Marathon Maniac shirt? Is it all the exposure from The Marathon Show? It’s probably a combination of all of the above. I’m not going to lie, I love the attention. Bling Bling! I love the medals! Only on the marathon course can I get and give free therapy. Before I started running, I thought a marathon was 10 miles, Badwater was a really awful drink, Western States meant CA, WA, and OR, and the IT Band was a group of guys from the IT department getting together to play some tunes for the company Christmas party. I’ve come a long way! Even on my bad days, when I am gasping for air trying to run away from the sag wagon, I am still having fun. I like that after every race I run, I make at least 25 new Facebook friends and fans. Running a half marathon is like one big stage production, and I am the star for 13.1 miles. I love the standing ovation I get when I cross that finish line. The thrill is doubled when I run a full marathon! Where else but at a marathon can I put a smile on someone’s tired face by running around in a cape and spraying them with endorphins from my index finger? It’s like a video game! The more marathons I run, the more Marathon Maniac stars I get. The more half marathons I run, the more Half Fanatic moons I earn. The more race miles I crank out, the closer I get to my running club's Mongo Trophy. When I crossed the finish line of a race in Laguna Hills in the spring, there was a sign that read "athletes only." I looked around for the athletes and then realized that the sign was referring to me! I may not be an athlete in the conventional sense of the word, but I always get out there and do my best. 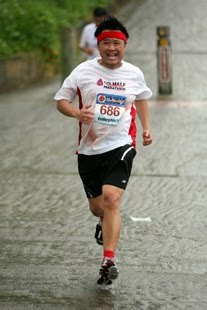 When life dealt me lemons, I squeezed those suckers into a water bottle, mixed them up with Cytomax, took a shot of GU, and ran a marathon! Behind every great dude is an awesome dudette. 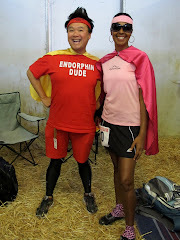 The Endorphin Dudette is a powerful running super chick. Any Dudette who can finish a half or full marathon and still be able sport a big smile and ooze endorphins out of her pores is a winner. 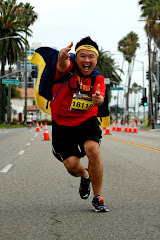 This marathon caped crusader is seeking fun, vibrant, endorphin-filled dudettes to help him change the world, one molecule at a time! Every month, a different dudette will be selected to help spread the word of fitness and fun at a marathon. Do you have what it takes to represent the Endorphin Empire as the Dudette of the month? Who would have thought that the fat kid who always got picked last in PE would grow up to have friends who are Marathon Maniacs, Guinness world record holders, super star tri-athletes, and Badwater Bad Asses? I feel like a winner every time I cross the finish line. I may not be the fastest in the pack, but I always finish, and when I do, I feel like I've won the Boston Marathon. People tell me that my running inspires them. I like hearing that. I am all about out reach, and if I can inspire one person to get out there and make healthy changes to his or her life, then my job is done. My life got exponentially better when I put on my first pair of Mizunos and ran around the block. Running has turned me into someone I really like. A healthy dude is a happy dude. There's this thing called runner's high. The best way for me to explain this is to show it. Click on the above photo to see what endorphins are all about. EEK! If you put a magnifying glass on that tape measure, you see that the number is 44. I used to have a 44 inch waist! I am now at a 32.